As reported by German news publication Der Spiegel, citing the new set of leaked documents provided by former NSA contractor Edward Snowden, the five major intelligence agencies including NSA and GCHQ have been collaborating to get near-real-time visualization of the global internet as a part of NSA’s ‘Treasure Map’ surveillance program, also dubbed as "the Google Earth of the Internet." The data collected by the intelligence agencies doesn’t just include information from large traffic channels, such as telecommunications cables. Rather, it also include information from every single device that is connected to the internet somewhere in the world — every smartphone, tablet, and computer — "anywhere, all the time," according to NSA documents. "[The program aims] to map the Internet, and not just the large traffic channels, such as telecommunications cables. It also seeks to identify the devices across which our data flows, so-called routers. 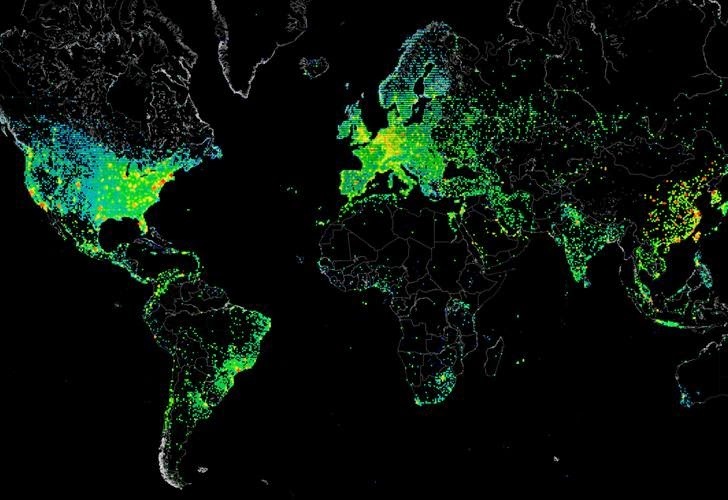 [The program] allows for the creation of an ‘interactive map of the global Internet’ in ‘near real-time,'" the report said. The Treasure Map program was described by Snowden as "a 300,000 foot view of the internet," as it allows agencies to collect Wi-Fi network and geolocation data from around the world, along with 30 million to 50 million unique internet provider addresses. The program was first made public by the New York Times report late last year, along with other documents by Snowden. But at the time, the US intelligence officials apparently claimed that program was not used for surveillance purposes, but only for mapping foreign and US Defence Department networks, "limited by the amount of data available to the agency," according to the NY Times report. Der Spiegel reported that the Treasure Map PowerPoint presentation highlighted the agents which carriers and internal company networks Five Eyes agencies — those in the US, Australia, the UK, Canada, and New Zealand — claim to have already accessed. German parliamentary investigators plan to question executives of telecommunications operators about the program under which the agencies have been breaking into service providers' networks to monitor them. However, Deutsche Telekom reportedly said it had found no evidence of manipulation or external access to its networks. "We are looking into every indication of possible manipulations, but have not yet found any hint of that in our investigations so far," a Telekom spokesperson told Reuters in a statement. "We're working closely with IT specialists and have also contacted German security authorities. It would be completely unacceptable if a foreign intelligence agency were to gain access to our network." The NSA is yet to comment on the latest round of allegations involving Treasure Map. Whereas, GCHQ said that its work "is carried out in accordance with a strict legal and policy framework, which ensures that our activities are authorized, necessary and proportionate, and that there is rigorous oversight" by other government agencies, Bloomberg news reported. Germany's NSA Inquiry Committee was established in March to investigate allegations by Global surveillance whistleblower Edward Snowden that the US government has been eavesdropping German citizens and even bugged Chancellor Angela Merkel’s personal cell phone, an issue that has strained relationships and raised trust issues between old allies, Berlin and Washington. The relations between the two became even more worse when two months back, Germany arrested a German intelligence officer who worked as a double agent and passed information to the CIA about the parliament’s NSA investigation, which shows that the US snooping is ongoing.